You've devoted yourself to an art form that creates a legacy. You deserve a machine that is as serious about your hobby as you are. Let Janome's Horizon Memory Craft 9450QCP Professional take your creations to new heights. 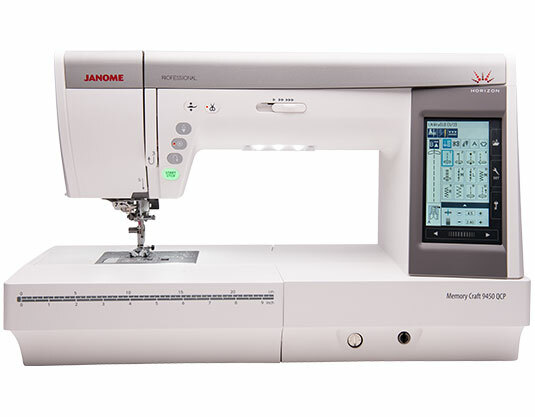 The Horizon Memory Craft 9450QCP has all the features you require to simply sit, relax and sew. The large LCD color touch screen makes it so easy to navigate through the 350 built-in stitches, including 11 one-step buttonholes and 7 alpha numeric fonts including 9mm lettering and numbers. You can customize each stitch, including buttonholes, plus save as a favorite stitch. Sewing applications gives you a variety of pre-set stitch functions, ready to sew zips, blind hem, buttons, quilting, rulerwork, patchwork and lots more.